As noted in a previous editorial, starting this year in 2019 with volume 16, Journal of Real-Time Image Processing is going to publish 6 issues per year with each issue having a page budget of 250 pages. The purpose of increasing the frequency of issues and the number of pages is to diminish and ultimately eliminate the backlog of accepted papers that are published online waiting to appear in a print issue. Furthermore, this increase in the number of pages will address the increase in the number of manuscript submissions in 2018 by more than 10%. Due to the increase in the number of pages, a total of 19 papers are included in this issue. These papers are listed in the table provided in the editorial together with the keywords that define the scope or theme of these papers. The keywords listed in the table can be used to quickly locate papers that are of particular interest to readers. Lately, we have been receiving many requests from researchers to offer special issues. Although special issues are encouraged and welcomed as they provide a comprehensive look at a particular real-time image processing topic, here we wish to re-state the following three major items regarding special issues. 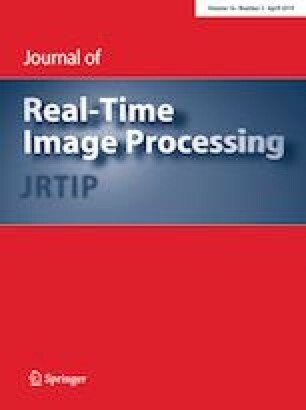 First, proposers or guest editors of special issues should note that the thrust of Journal of Real-Time Image Processing is on the real-time aspects of image and video processing; examples of these aspects include, but not limited to, computational complexity analysis and reduction compared to existing solutions, real-time hardware implementation, and steps taken to achieve real-time throughput. It is worth noting here that although the generic interpretation of the term real-time is to perform processing at the rate of about 30 frames per second, it involves different rates depending on the application of interest. For example, in high speed camera applications, the real-time rate is much higher and in robot vision or automatic visual inspection applications, real-time operations can be achieved at lower rates. It is essential for any special issue topic to fall into the real-time theme of the journal. Second, in order to receive adequate number of manuscripts for an issue to appear as a special issue, it is important for guest editors to first contact and identify the area experts who would be willing to submit manuscripts to their special issues. It has been observed that relying solely on the Call for Papers (CFP) for a special issue would not generate adequate number of manuscript submissions to fill a special issue after accepting the high quality ones. Third, if a special issue is to be offered as a selection of manuscripts addressing real-time aspects of image or video processing that have been presented at a conference, the contents of the manuscripts to be submitted to the special issue must contain at least 50% new unpublished contributions beyond the conference papers due to the copyright and self-plagiarism issues that are involved. We are unable to consider special issues that consists of a selection of manuscripts whose contributions are more or less the same as those presented at conferences, workshops, symposia, etc. For additional information on special issues, proposers or guest editors are asked to strictly follow the “Guidelines for Offering and Managing Special Issues as Guest Editors of JRTIP” provided at https://static.springer.com/sgw/documents/1488308/application/pdf/SpecialIssueGuidelines_final.pdf when putting together their CFP proposals. Considering the critical role that reviewers play in evaluating submitted manuscripts, we wish to remind reviewers that Springer has a Reviewer Reward Program. Those reviewers who complete 5+ high quality reviews can request a certificate in recognition of their review efforts as professional activity. In addition, these reviewers are offered a complimentary Springer book to thank them for their reviews. Furthermore, those reviewers who complete 10+ high quality reviews can request to join the Editorial Board of JRTIP by expressing their interest to the Editors-in-Chief. We would like to state here that as done in previous years, an editorial board meeting will be held during the SPIE Conference on Real-Time Image Processing and Deep Learning (whose program appears in the backmatter of this issue) in April of this year in Baltimore as part of the SPIE Symposium on Defense and Commercial Sensing. The outcome of this meeting will be reported in the next regular issue editorial. As a final note in this editorial, we wish to thank the Associate Editors (AEs) Athanassios Skodras and André Stork, who are stepping down from their AE role, for their great service to the journal. Also, we would like to welcome the following five new AEs to the editorial board with expertise that are complementary to the existing expertise of the board: Gian Domenico Licciardo (Italy), Chen Chen (USA), Víctor Manuel Brea Sánchez (Spain), Frank Hannig (Germany), Khaled Ben Khalifa (Tunisia) and Gwanggil Jeon (South Korea). Real-time multi-class object detection using two-dimensional index—Dou, et al. High speed on-chip multiple cosine transform generator—Ismail, et al. FPGA implementation of an efficient similarity-based adaptive window algorithm for real-time stereo matching—Pérez-Patricio, et al. Park marking-based vehicle self-localization with a fisheye top view system—Houben, et al. An FPGA 2D-convolution unit based on the CAPH language—Aguilar-González, et al. Real-time implementation of an adaptive simultaneous dynamic range compression and local contrast enhancement algorithm on a GPU—Tsai, et al. Heterogeneous CPU–GPU tracking–learning–detection (H-TLD) for real-time object tracking—Gurcan, et al. Overview of efficient high-quality state-of-the-art depth enhancement methods by thorough design space exploration—Vosters, et al. Enhanced inter-mode decision algorithm for HEVC/H.265 video coding—Jaja, et al. Efficient reference frame compression scheme for video coding systems: algorithm and VLSI design—Silveira, et al. Overview and evaluation of the JPEG XT HDR image compression standard—Ten, et al. On the design of optimal 2D filters for efficient hardware implementations of image processing algorithms by using power-of-two terms—Horé, et al. Fast total least squares vectorization—Jelinek, et al. Exact window memoization: an optimization method for high-performance image processing—Farzmahdi, et al. A multi-FPGA architecture-based real-time TFM ultrasound imaging—Njiki, et al. MRI denoising by nonlocal means on multi-GPU—Granata, et al. Real time security framework for detecting abnormal events at ATM installations—Tripathi, et al. Design and implementation of an efficient hardware integer motion estimator for an HEVC video encoder—Alcocer, et al.